Greening Our Life: Vegie patch - now with plants! Last weekend I finally got around to transplanting plants from the multitude of pots cluttering the back veranda into the vegie patch. And voila! The top bed (which is the one on the left) has all the strawberry plants. I tried planting out a couple of the runners. One survived, one didn't, but the surviving plants are doing well. One is currently flowering and fruiting. The next bed has most of the more established tomato and capsicums that I had in pots. I've also planted the basil seedlings between them. They seem to be going okay, but the leaves are going a bit yellow. Ms D has mentioned this is probably because I've mulched with lawn clippings and a bit of blood and bone should do the trick. The next bed has some of the tomato and capsicum seedlings that were still in the seedling trays, plus the parsley and coriander seedlings. At the end of each bed I've transplanted the pyrethrum and borage seedlings. I'm hoping these will be good companion plants and help deter bugs. Unfortunately, they're still tiny so they aren't doing much yet. Of course, there has been one minor hitch in that the days after I planted everything into the vegie patch have turned out to be among the hottest and driest all month. I did mulch everything with lawn clippings to help reduce water loss. The smaller seedlings seem to have suffered the most. C'est la vie. I have more seeds. However, the Cunning Plans Dept has rigged up a pretty nifty system to get rain water from our rain water tank to our garden without exposing parts of the system to unintentional "lab testing" by Hudson and Gracie (they eat hoses, hose fittings, anything really...). The 2500L rain water tank sits down the side of the back veranda (Fig.1). The CPD then dug a trench on the top terrace to sink a pipe that runs from the tank and pops out the side of the terrace retaining wall. 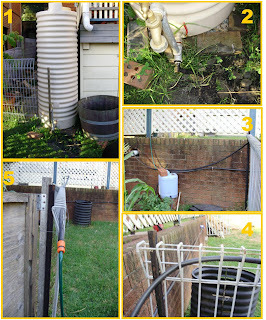 A length of hose then runs from the tank, through the pipe (Fig.2) and pops out the retaining wall, which is contained within vegie patch MkI (Fig.3). The hose is then threaded through the top of the weld mesh fence of vegie patch MkI (Fig.4) and at the end of the fence there is a hose attachment (Fig.5)to we can attach a hose to water vegie patch MkII. Because the tank is uphill, there is no problem with water pressure. This weekend we bought some weeper hose to put under the mulch in the vegie patch as the main irrigation system. This will probably involve burying a pipe between vegie patches 1 and 2 so that we can leave the irrigation hose connected and just turn it on and off from the tank. The other plants are doing well. The first sunflowers have finally opened. The marigolds are in bloom. They are incredibly cheerful looking flowers. The bonus compost tomatoes out the front appear to have both romas and regular tomatoes.